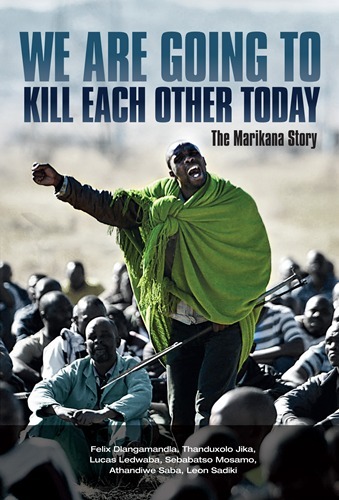 This is an examination of the Marikana Massacre, its causes and consequences by a group of journalists and photographers who were eyewitnesses before and after the tragedy. On 16 August 2012, after a standoff lasting several days, the police opened fire on striking mineworkers who were gathered on a koppie in Marikana. The shooting provoke national and international outcry, and was compared to the Sharpeville massacre that happened under Apartheid. Miner Mgcineni Noki, who became known as the Man in a Green Blanket, and the face of the striking miners, is on the cover of the book. This is the man who was described by the police as a blood-thirsty warrior itching for war. Ledwaba had spent days talking to Noki, to present a human side to the man regarded as an ogre. He was a father from Mqanduli in the Eastern Cape who came to the mines to eke out a living for himself and his family and was caught up in the politics of the mining industry. This book tells the story behind the newspaper headlines. Who was involved? Where did the miners, mostly migrant workers, come from and what were their personal circumstances? The authors explore the realities of their lives and also tells the story of “the man in the green blanket”, who became a symbol of the strike. The writers also examine the role of the mines – Lonmin in particular – and the competing unions, NUM and Amcu. And what role did traditional beliefs play – did a witchdoctor aggravate the situation? The book contains a section of mostly unpublished photos which chronicles the events from a different angle. It will take many years to forget that tragic day when striking miners sang battle songs, raised their voices to be heard. But, for 34 men, they were singing for the very last time. This is a brilliant example of incisive investigative journalism at its best as it looked at the events leading to the tragedy, the parties involved and analyses their roles.